Hearing the Homeless is creating a community of support for the homeless. Hearing the Homeless (HTH) is a registered nonprofit 501(c)(3) founded in Austin, Texas. HTH utilizes storytelling and art to empower and inspire both homeless and non-homeless alike. By documenting these snapshots of humanity, we hope to show you that nothing is more deserving of investment than human life. There is no darker place than the belief that light will never return. We strive to shine our light into the darkness with the hope others will do the same. One person can’t do everything, but one person can do something, and together, we can change the world. Join the HTH community and help us to shine a brighter light. Your support will allow us to shine a brighter light and foster sustaibable change in the lives of the homeless community...one human at a time. As we grow and become sustainable we aim to develop a platform that will allow others to become sustainable through offering micro-enterprise jobs to pay for things such as certifications, transportation, medical procedures, etc. Your patronage in our early stages will pave the way for us, to pave a way for others. Join HTH as a Patron and help us paint a brighter picture for those living in darkness. Hear how Kevin, founder and CEO of HTH, developed a heart for the homeless at a young age. Growing up in a small town, I was pretty sheltered. I had no clue how big of an issue homelessness was. 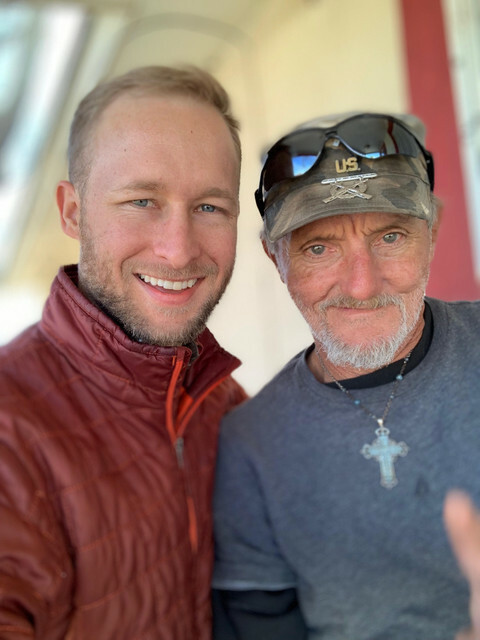 My town only had one person who was homeless, a man by the name of Ricky D. Over a fifteen-year period, Ricky D and I developed a deep friendship. Initially, I was drawn to Ricky D because of his incredible stories. I would spend hours outside of that tin shed he called home, captivated by his stories of life in the 70s, Desert Storm, and his travels across America. I learned many valuable lessons from Ricky D, but the most important lesson I learned was power of genuine human connection. Human contact is a basic human need. Despite some donations of food, clothing etc, no one ever spent time with Ricky. Most people will never understand the sheer psychological isolation homeless people experience, and just how detrimental that can be. But by spending time with Ricky, and by establishing a genuine friendship with him, I was able to, in some ways, bring him back into society. I was able to impact Ricky D’s life financially, but more importantly establish a genuine friendship, and that my friends is priceless. I vividly remember the first day I visited Austin. Driving in and seeing the incredible skyline, the beautiful murals, the lake. I felt so inspired and connected. Then I drove into the downtown area and for the first time I saw what homelessness looked like on a systemic scale. It was something I will never forget. I received the vision for Hearing the Homeless a week after moving to Austin. The vision was to create a platform that humanizes the homeless while giving the community a secure pathway to directly impact one human at a time, as I had done with Ricky D. A platform where the homeless can be heard and the community help, effectively and efficiently using technology. Today, Ricky D. has a stable home, steady income, is active in his community, while also enjoying his main passion, creating artwork. We are on a mission to alter the story of homelessness using the power of technology, art, and human connection, so that we can paint a brighter future for those living in darkness. Join the movement and help us to impact one human at a time. All pledge levels provide access to all content on the Patreon page, and go toward the creation of the Hearing the Homeless crowdfunding platform. Pledge whatever amount you're comfortable with. Hearing the Homeless is a 501(c)(3) organization so your donation is tax deductible. Once we hit our goal of $1500, Kevin, the Founder of HTH, will be able to spearhead the project full time.